PFO Tech's wearable security technology already protects human rights activists, political dissidents and aid workers in 15 countries. Today sees the launch of the new generation "PFO Shield" - the market's most advanced safety and security concept with GPS / GSM for journalists, humanitarian organisations and companies in dangerous environments, the world over. PFO Shield is an app for smartphones that is combined with a patented GPS/GSM bracelet, or any other of PFO Tech's security products. The system gives the user the ability to connect one or several persons to their app and, in the event of an emergency, to easily trigger an alarm that reaches the group with information about the user's location. PFO Shield is developed to provide both individuals and companies with dynamic, efficient and immediate protection - in Sweden and globally. Working conditions for journalists, aid workers and the like in countries ravaged by civil war, social instability or dictatorships have become considerably more dangerous over the past 10-15 years. People in these occupations are increasingly becoming subjected to attacks and kidnappings, and in 2014 alone, almost 100 journalists have been reported killed, internationally. - Journalists, aid workers and employees in dangerous environments make up an increasingly vulnerable group today. Our mission is to give these people increased safety and security by developing technologies around the wearer. We know that the opportunity to immediately report an incident is crucial, and our technology allows a wearer to do just that, says Johan Carlsson, CEO of PFO Tech. PFO tech's personal safety technology aims primarily at companies, press and humanitarian organisations with staff in dangerous countries or environments, and PFO Shield can also be combined with PFO Tech's GPS/GSM bracelet for use in larger working groups, worldwide. 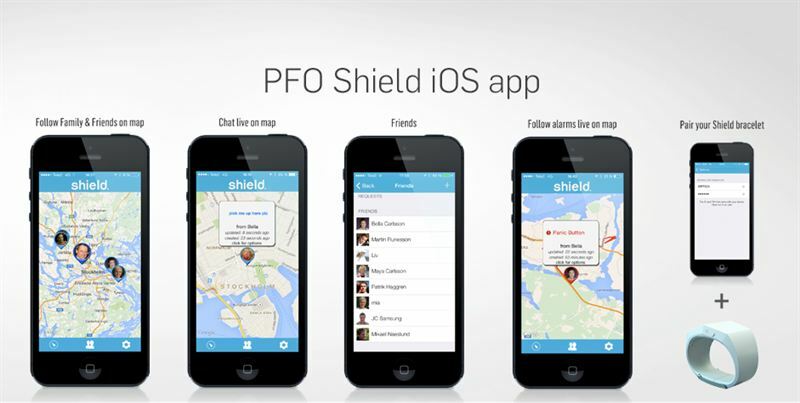 The PFO Shield app is also an excellent service for every parent wanting to give their child/children increased security in their mobile phone on their way home from school. PFO Shield – Because safety is a basic human right.